This is a USSbrief, published on 5 February 2018, that belongs to the OpenUPP (Open USS Pension Panel) series. This is a revised version of a presentation given at the CSFI Roundtable ‘Pension funding: more than an academic question’ on 27 September 2018 in Wax Chandlers Hall, London. The Universities Superannuation Scheme (USS) is only the latest in a long line of private sector Defined Benefit (DB) pension schemes to be threatened with closure under the current system of regulation — even as it is the largest in terms of assets and number of members. Members have seen through the reasons given for this proposed closure, and took industrial action in 2018 to challenge the USS valuation. They, being mainly academics, and, as such, disinclined to accept anything on trust, and to think things through from first principles for themselves, questioned the methodology that would lead to this apparently well-funded scheme being suddenly closed to DB accrual. Lack of transparency and exaggeration of risk: The regulation system prioritises what it defines as the Statutory Funding Objective. This is supposed to ensure every scheme has enough assets to cover what it calls its technical provisions,  but I will argue that fails to give a true picture of the health of an open  pension scheme. It is problematic in two ways. First, it is not transparent, because it focuses on a poor indicator. Second, and worse, it greatly exaggerates risk, which has to be dealt with at great cost. I argue against this monistic approach and for economic pluralism in the monitoring of pension schemes. This means trustees should look at them in the round, using a range of methods and criteria — not only balance sheet valuations of liabilities and assets on a mark-to-market basis at a moment in time. 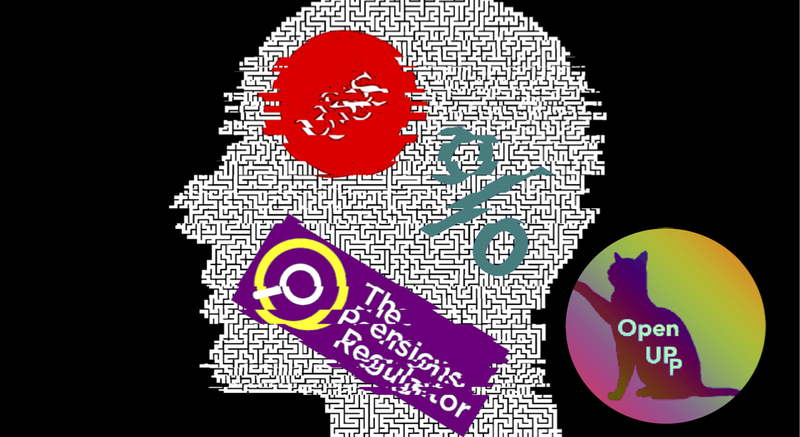 Circular reasoning: The regulatory system allows circular reasoning because assumptions that are made about the risk of sponsor failure, that are fundamental to the liabilities valuation, become self-fulfilling when that risk is itself taken to depend on the valuation. Pessimistic assumptions lead to schemes being forced to close as a result of those assumptions being made even more pessimistic by the valuation approach. Macro-economic damage: Besides limiting pensions provision for millions of people, with consequent erosion of the social fabric as older people lose quality of life, the regulatory system also does macroeconomic harm, hampering economic growth. This is the result of the adoption of false economic theories over empirical evidence. A pension is an income for life during retirement, which has to be provided for during an individual’s working life. But goods and services that are consumed during retirement — the real brass tacks of what a pension is — cannot themselves be provided during working life, for numerous obvious reasons. First we cannot simply assume that every individual has a well-articulated plan for their spending and saving behaviour over their lifetime, despite the simplistic assumptions often made by theoretical economic models. It is unrealistic to assume that every individual is born with fixed preferences about their consumption and saving over their entire lifetime; the practical usefulness of thinking in that way cannot just be assumed, but needs to be demonstrated. It is more realistic to assume a person cannot really predict what their demands will be during retirement, since they have very little knowledge of life in retirement until it happens. Also retirement is a single irreversible life event, and cannot be repeated if mistakes are made. Retirement is all about imperfect information: it is not something that can easily be modelled as a market transaction under the rubric of homo economicus. Second, with a few exceptions, it is obvious that most goods cannot be stored physically. One could imagine squirrels doing it, but not humans. A pensioner’s daily bread has to be freshly baked: it cannot be stored away for years until needed, after having been purchased during working life. And if storing goods for consumption in retirement is impossible as a practical matter, storing services is inconceivable. One has to purchase personal services, such as holidays, medical treatment, and social care, as they are needed — using cash. All this is obvious. It follows that almost all pensions — viewed as goods and services consumed by the retired — must be supplied by the workforce as they are needed. In this basic sense, all pensions should be conceived of as pay-as-you go. This requires transactions between generations. Looking only at pension scheme funding in financial terms, as the regulations require, does not directly address the question of how the goods and services demanded by pensioners will in fact be provided. It is here that the lens should be focused if regulation is to be properly transparent. There is a missing extra step, which the present funding approach of comparing assets and liabilities totally ignores. That is how asset values are later converted into pensions in the form of income to pay for goods and services consumed. A scheme may be 100% funded in 2018, but that tells us little about whether the income the assets will provide in 30, 40 or 50 years from now will be enough. All sorts of developments may have occurred in the intervening period, most relevantly demographic and macroeconomic changes. What the regulations should be asking is how the assets in a fully-funded scheme will ensure that pensioners have enough money to pay the future workers that will be employed to satisfy their wants. That would mean actuaries forecasting future income and benefits using all available information. The approach that is currently required, by contrast, assumes that asset prices contain all future relevant information. It cites simplistic financial economic theory, which, as I show in the next section, is not transparent. This is without considering the problems inherent in estimating a capital figure for the liabilities. That is based on the scheme rules and forecasts of earnings, inflation, mortality, and so on, all of which components can be forecast on prudent assumptions made by the trustee. The regulations require that the resulting time series of benefit forecasts — for every year from the present into the distant future — be converted into a single capital sum, using the discounted present value method. Therefore the estimated present value of the liabilities is a wholly artificial construct, because it depends above all else on the choice of discount rate. Valuing pension liabilities raises difficult and even unsurmountable theoretical problems. The problem with the regulations (and the way they are applied) is that they focus on a comparison of capital values (assets valued at market prices, versus a capitalised liability estimate), rather than a comparison of income (from contributions and investments) with benefit payments. Comparing assets and liabilities is a balance sheet matter: it is not the same as ascertaining whether there will be enough money to pay the pensions when they are due. That is a question that is fundamentally about budgeting income and outgo. From Shiller, Irrational Exuberance (Revised and Expanded Third Edition), p.210. The diagram shows two historical time-series plots for US equity prices: the actual stock prices (heavy irregular curve labelled P) and the ‘clairvoyant’ or perfect foresight values, that would prevail if the market behaved perfectly in line with the theory; these have been constructed using historical dividend payments, as the discounted present value of future dividends (dashed smooth curve labelled P*). The theoretical model predicts that the two graphs should be pretty much the same. Prices should be the expected discounted present value of future earnings, with expectations based on all publicly available data at the time. Yet the graphs are strikingly different and do not comply with that at all. It would be hard to imagine stronger evidence against the efficient markets theory than this. Usually, when a scientific theory is so decisively refuted when confronted with evidence, it would be rejected — and anyone relying on it as authority would no longer be given credence. Yet, although Shiller’s findings were originally published as long ago as 1981, and moreover prominently so (in the most prestigious and widely read academic economics journal in the world, the American Economic Review), it did not happen in this case. Or, at least not as far as financial economists are concerned. More seriously, if policy makers have also ignored such strong evidence and gone ahead with designing regulations based on a theory that flies in the face of the evidence, that is surely unethical. A valuation methodology for assessing the condition of a pension scheme that relies on a comparison of asset values with a capitalisation of the liabilities is lacking in transparency for two reasons. First, capital values are imperfect indicators, for both the assets and liabilities, whichever discount rate is used to compute the liabilities. How asset values get translated into pension income remains an open question. The efficient markets theory merely postulates a one-to-one relation between the price of an asset and its earnings, sidestepping all sorts of real-world complications with an assumption of perfect markets, specifically ignoring excess market volatility. Second, because the market values of assets are excessively volatile, basing valuations on them, rather than the underlying earnings, means treating the volatility as risk, thereby overstating risk by the extent of the excess volatility. Many schemes have been forced to close when their actuary has told the trustees that there is an actuarial deficit so large that the recovery payments required were beyond the sponsor’s means. But this could be the effect of circular reasoning, resulting in a mistaken decision. In choosing the discount rate, the trustees are essentially making a judgment about the likelihood of a market downturn happening just at the same time as pensions need to be paid, putting extra demands on the sponsor to step in with extra cash. If it is believed that the sponsor will not be able do that, then avoiding risk requires a very prudent investment strategy, based on low volatility assets such as bonds, the second of the two alternatives allowed by the regulations. There is a very prudent valuation and a low discount rate; the result is a high figure for the liabilities. It follows that if the reason for a deficit is that the liabilities are inflated because of the use of a very low discount rate, due to an over-prudent assumption about the sponsor covenant, that is really circular reasoning: the liabilities valuation is so high because of an assumption that the sponsor could fail to support the scheme as a result of the scale of those same liabilities, making that failure virtually inevitable. Such reasoning should not be taken as evidence of an unsustainable deficit, since it is circular. It is to assume a result, build that assumption into the valuation methodology, and then to find the result initially assumed. On the other hand, had the liabilities been estimated on the reasonable assumption that the covenant is strong, enabling the assets to be invested in high-return equities instead of low-return bonds, and a higher discount rate chosen accordingly, the deficit would have been deemed small enough for the scheme to be sustainable. Although equities are conventionally assumed to have high short-term volatility compared with bonds,  this would not pose a risk, because investments would be held long term to match the long-term pensions commitments. Therefore the assumption of a strong covenant is self-reinforcing. The current valuation methodology has serious macroeconomic implications, which are rarely discussed. First, the large deficit recovery payments that the sponsor has to make are a form of saving that takes demand out of the economy and therefore recessionary. While deficits are notional valuations, the regulations treat them as if they were real, and the sponsor must make recovery payments in real money. The FTSE 100 companies alone have made deficit recovery payments of £150 billion over ten years. This, in effect, is a forced increase in saving, which means spending power is taken out of the economy. The resulting loss of effective demand limits economic growth in the short run. Second, this requirement for deficit recovery payments creates an incentive for sponsors to limit investment expenditure on capital formation, in order to channel funds into the pension scheme. This is damaging for productivity and impacts on long run economic growth. Third, it also makes DB pensions more expensive to provide, which leads to under- provision of decent pensions. This creates pensioner poverty and more dependence on state support. Employers will find this to be a major problem, as it becomes more difficult to manage an older workforce, many of whom cannot afford to retire and wish or need to continue working. The current system of pensions regulation that centres on the statutory funding objective, using mark-to-market asset valuations, lacks transparency for open schemes, because it focuses on assets rather than the earnings those assets bring, out of which the pensions are paid. Asset prices are only very weakly related to future earnings and therefore are a poor indicator of the funding adequacy. This leads to the overstatement of market risk, because asset prices are greatly much more volatile than investment earnings. In consequence valuing pension schemes by asset prices means giving undue significance to this excess volatility. Excess volatility means excess risk, which could be avoided by a regulatory focus on a comparison of pension fund income with the payment of benefits. This lack of transparency and overstatement of risk are the result of the use of thinking from financial economics. By its insistence that markets everywhere and always are perfect and that all who trade are infinitely omniscient and relentlessly selfish individuals, these problems are usually dismissed by a simple appeal to the authority of financial economics. When presented with clear empirical evidence, from a substantial literature going back as far as the 1980s, against the efficient markets hypothesis, financial economists assert that it cannot be true since otherwise there would be unused arbitrage opportunities, which cannot exist in their world. Against that, I insist on the overriding principle that scientific knowledge must always respect evidence over a merely theoretical assertion. The scheme has over 200,000 actively contributing, also approximately 70,000 retired, and 150,000 deferred members. The term ‘technical provisions’ refers to the actuarial estimate of how much money should be invested today to pay all the present and future pension benefits as they fall due. I am concerned here only with open schemes like the USS. The regulations seem to have been designed with closed schemes in runoff, where there is no new accrual, in mind. See for example Exley, CJ, Mehta, SJB, and Smith, AD ‘The financial theory of defined benefit pension schemes’ British Actuarial Journal, 3(4) (1997): 835–966. From Robert Shiller, Irrational Exuberance, Revised and Expanded Third Edition, Princeton University Press, 2015, p. 210. 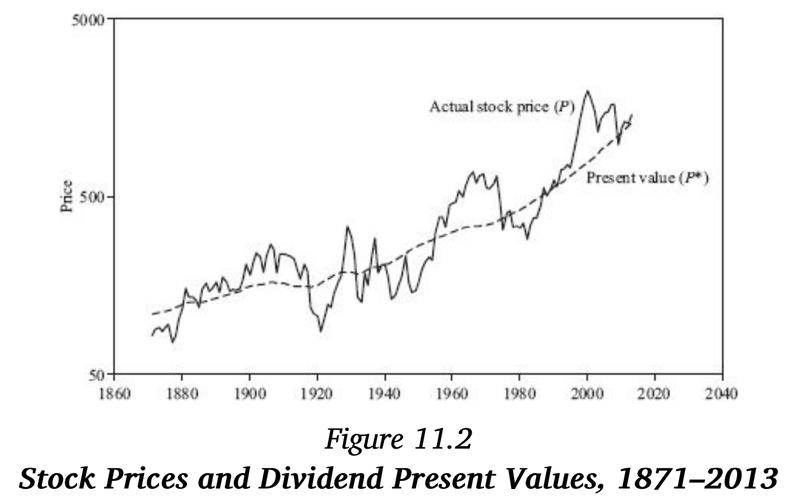 This is a revised version of the graph from Shiller’s famous paper, ‘Do Stock Prices Move Too Much to be Justified by Subsequent Movements in Dividends?’, American Economic Review, Vol. 71(3) (June 1981), pp 421–46. The graph shows the real, inflation-adjusted, S&P Composite Stock Price Index, 1871–2013, and present values, 1871–2013, of subsequent real dividends calculated using a constant discount rate, according to the efficient markets theory. Shiller, Irrational Exuberance, p. 211. This is for equity markets. Shiller, Irrational Exuberance shows that excess volatility exists in bond and real estate markets as well. Campbell, JY, and Shiller, RJ (1988) ‘The dividend-price ratio and expectations of future dividends and discount factors’ The Review of Financial Studies, 1(3), 195–228; cited in Shiller, Irrational Exuberance. Campbell, JY, & Ammer, J (1993) ‘What moves the stock and bond markets? A variance decomposition for long-term asset returns’ The Journal of Finance, 48(1), 3–37; cited in Shiller, Irrational Exuberance. I am only talking about the investment earnings here. In an open pension scheme, there is also contribution income paid by members and employers. This is particularly true of the USS where, because it is a very young scheme, the pension benefits in payment (£1.8 billion in 2017) are currently completely paid for by the contributions (£2.0 billion), and investment income (£1.5 billion) is not immediately needed and is re-invested. See USS Annual Reports and Accounts. The Pensions Regulator, Funding Defined Benefits, Code of Practice no. 3 July 2014. It is important to point out that the pension regulations do not require the liabilities to be valued in the same way as the accounting regulations do, which require discounting by the rate of return on long-term gilts or AA corporate bonds. Interest rates are currently extremely low, owing to the government policy of quantitative easing. This is essentially what all the discussion surrounding USS’s Test 1 is about. See the report by First Actuarial, ‘Progressing the Valuation of the USS: Report for the UCU, September 2017’. The view that equities are inherently risky and bonds riskless is held virtually without question by many. It is taken to be axiomatic in financial economics. However, it is not uncontroversial, and there is published evidence to the contrary. See Baker, Nardin L and Haugen, Robert A ‘Low Risk Stocks Outperform within All Observable Markets of the World’ (April 27, 2012). LCP, £150bn contributions do little to dent FTSE 100 pension scheme deficits, 8 August 2017. This is a USSbrief that belongs to the OpenUPP (Open USS Pension Panel) series. This paper represents the views of the author only. The author believes all information to be reliable and accurate; if any errors are found please contact us so that we can correct them. We welcome discussion of the points raised and suggest that discussants use Twitter with the hashtags #USSbriefs67 and #OpenUPP2018; the author will try to respond as appropriate. This work is licensed under a Creative Commons Attribution-NonCommercial-NoDerivatives 4.0 International License.